In this very dry period, we have tried to reduce the use of water from our well on the display beds and some newly transplanted shrubs. If we notice signs of wilting, we try to give each plant just enough water to get through until the next rain, (not that we’ve had one or truly expect one in the near future, ugh!). What has worked well is to take a large can (a quart at least, or small bucket) and poke a very small hole in the bottom of it near the edge. 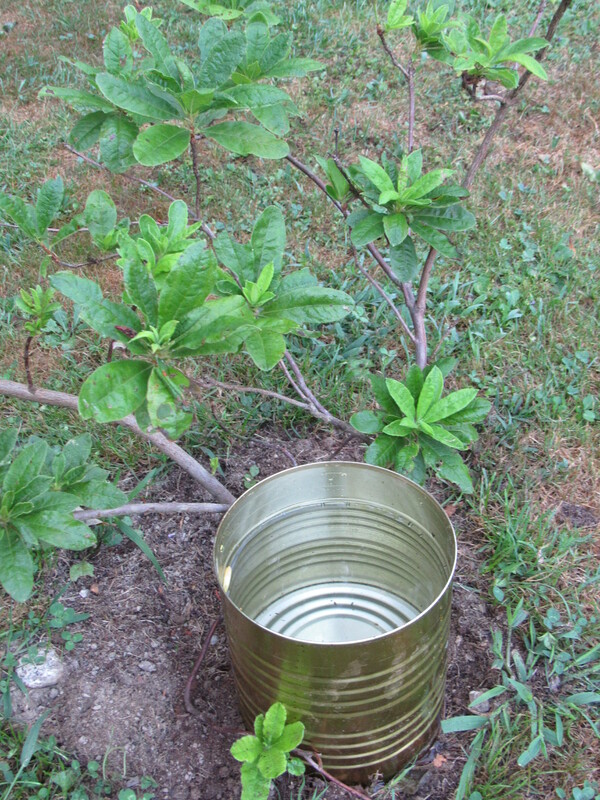 We then place the can next to the plant with the hole as close to the stem or crown as possible and fill it with water. The water will then slowly drip down to the roots and not run off as it would if just poured on the ground around the plant. All of the water goes to the plant. In our display beds, some plants do not handle the prolonged drought as well as others. This way we can selectively deliver water to them and not have to water the whole bed. It has been very easy to do and has kept many plants from shriveling up without using a large volume of water. We have not had a good rain in weeks. Here in the northeast, drought is not something we consider common. We are lucky to have a fair range of weather….the right amount of sun, the right amount of overcast, the right amount of rain. Lakes, ponds, streams, and rivers spread across this state of Maine, we are water rich. This year, however, those precious water holes are a bit stressed, water tables are low, the lakes and ponds are well below normal levels. Our well here at the farm is a good one. We are very fortunate to be located above a healthy aquifer, but still, we conserve. 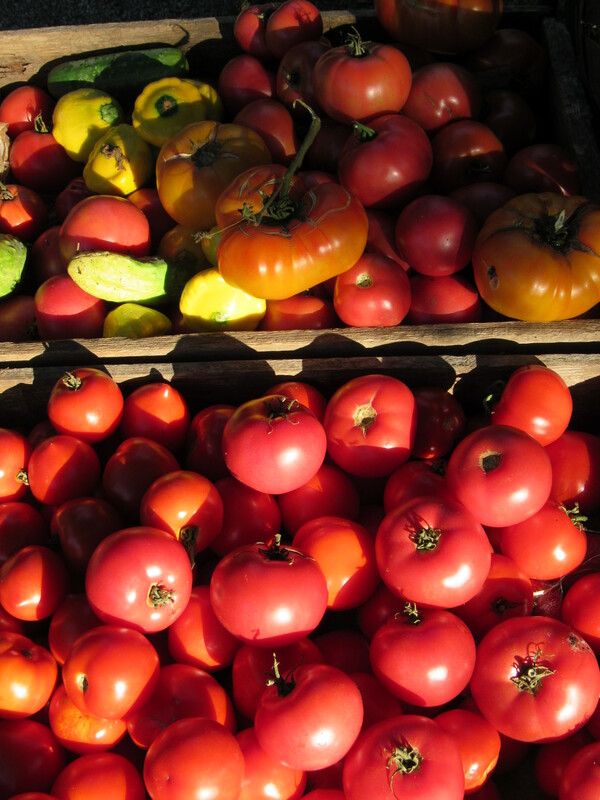 Let’s consider water as it should be…. a precious, life-giving, absolutely necessary resource, that everyone needs. Let’s consider water as nine-year-old Gabriel does…. picking up speed as it comes. If You’d Like To Join Us….. If you’d like to join us for an afternoon of building fairy houses on August 11th and August 25th, we still have a few spots open. Hannah has been busy buying clay, sorting through her pottery tools, and mixing glazes. If interested, check out our ‘classes and more’ page and call or email to hold your spot! 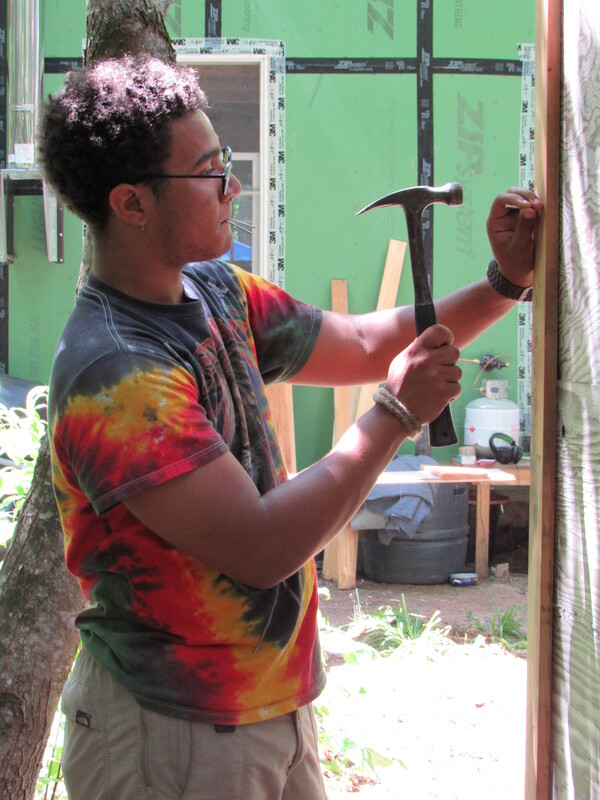 We’re looking forward to seeing how creative we can make our tiny homes! 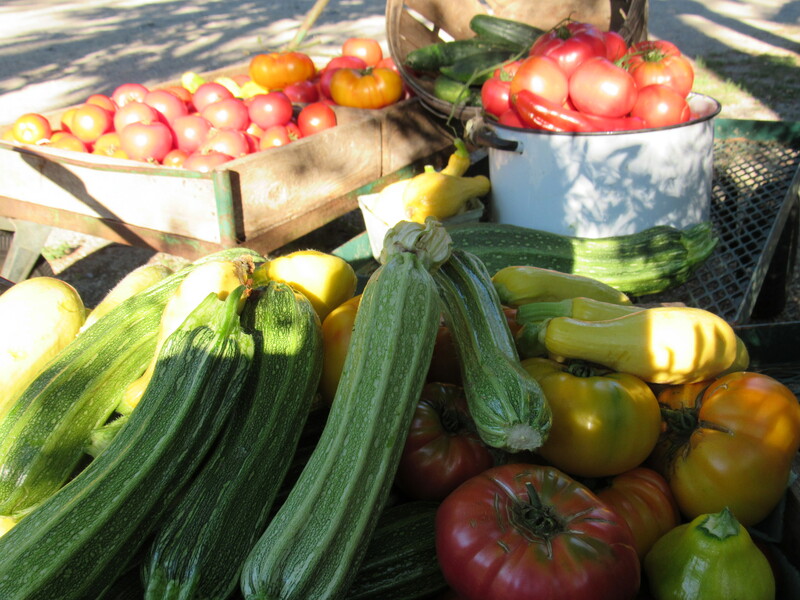 We have two WWOOF volunteers here at the moment. Our lovely returning WOOFer Hannah, who is a UNH student and ceramics teacher, and Zack, who may very well be the kindest and most polite 20 year old we’ve ever met. Both of these visitors are a great help to the farm and nursery. They are hard workers and upbeat, easy going and curious. We like them a whole lot. After a long day of farm work, moving sheep fence, and learning to shingle an out-building, they are tired. Farm tired. Work tired. Tired to the bone tired, but proud of their accomplishment tired. They sit in the evening after a good hearty meal, legs slung over the arm chair or stretched out across the ottoman, and knit. Both of them. Zack leading the way with his craft experience dating back to the age of 10 ( his mum taught him to knit, good mum!! ), helping Hannah to cast on with round needles and to keep her stitches from twisting. I join them, advancing on my current knitting project until my own sleepiness gets the best of me ( is it 8:30 yet?). Last night we talked about being tired. Hannah pointed out how good it feels to climb into bed, rest your head on a pillow, and know that you’ve really earned a good night’s sleep. We talked a bit about the different kinds of tired….emotional and physical, and how being emotionally tired may keep you up at night ( thoughts still racing), but being physically tired is conducive to collapsing into a decadent slumber. In your early twenties, I think sleep is still something coveted. I was amazed at how many times they both hit the snooze button on their alarm clocks before reaching their actual wake up time.I don’t use an alarm clock and waking to a buzzing noise every 5 minutes seemed pretty disruptive to me, but they assured me that this was all part of their morning ‘time to get up and pull yourself out of dreamland’ ritual. I told them I just wake up, eyes wide open, and bolt into the day. My approach seemed to scare the hell out of them.” Why would you do that?” they asked. After several rows and a few more inches on my own knitting, I trail off to bed. They’ll stay up a bit longer, I know. Tired they are,….bone tired…but can’t quite give up on their night life here at Fernwood. Knitting and drinking tea beyond a proper bedtime….. real party animals these two. And now a poem to sign off with…. Come Build A Fairy House! 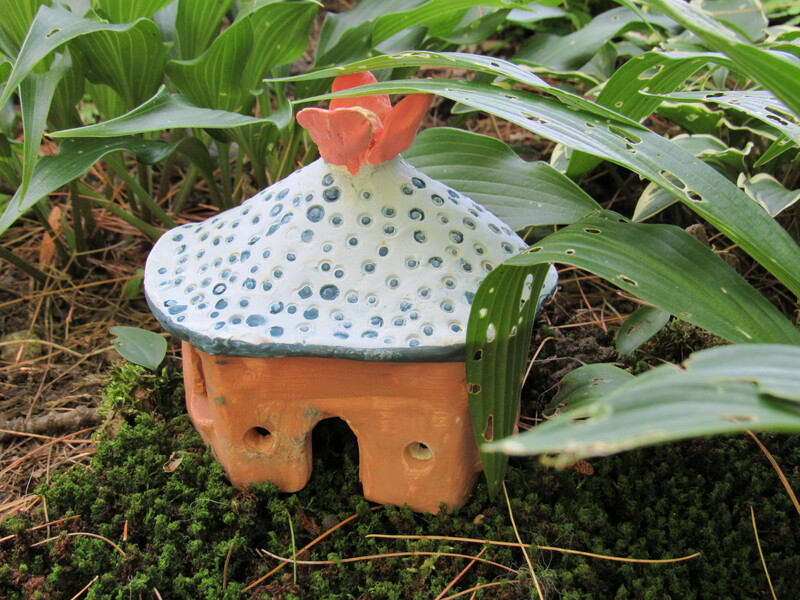 Join ceramicist and WWOOFer Hannah Medovnikov and Denise Sawyer in a two-part pottery class building miniature homes for your resident garden gnomes or fairies. 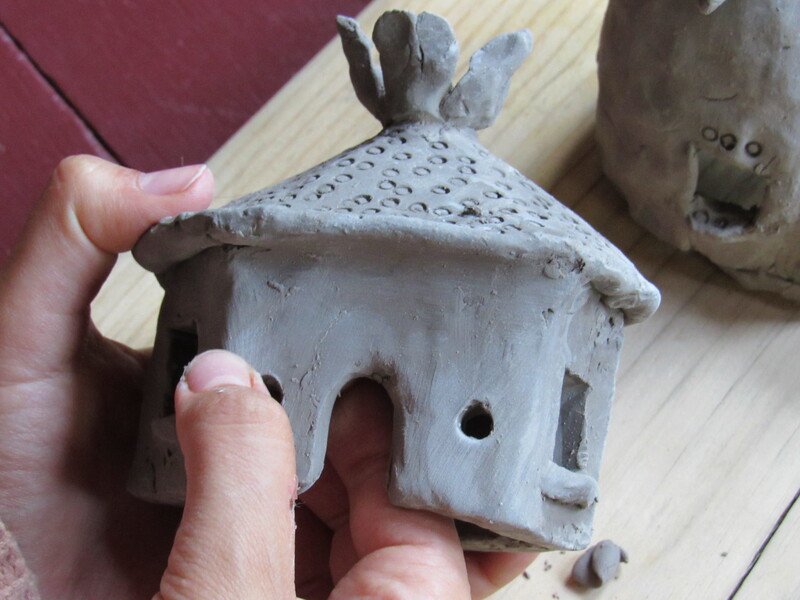 During the first session, participants will design and construct their fairy homes using clay and considering features to be embellished after firing. After the houses are dry, we will fire them and bring them back to be glazed during the second session. 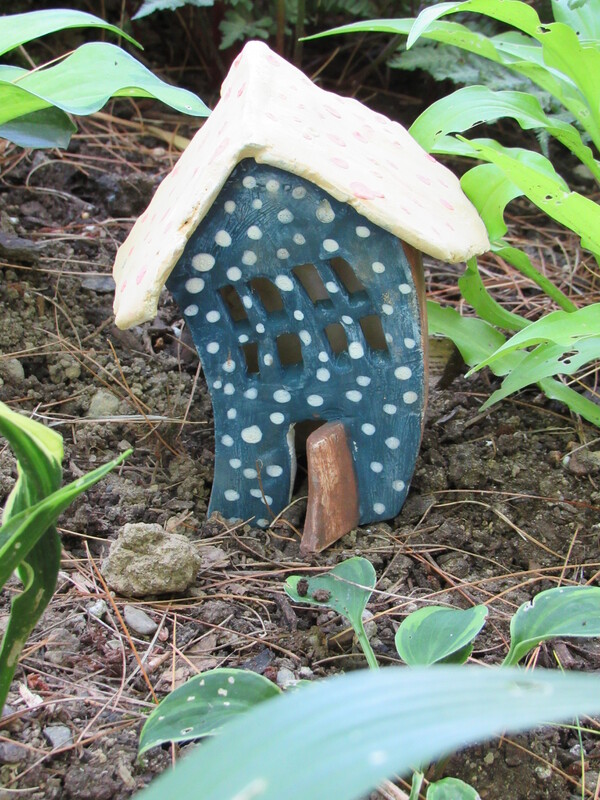 We’ll discuss ways to add ‘features’ to your fairy house….doors, shutters, and even a ‘living’ roof ! After the glaze firing your pieces will be ready for installation! We will be using slab building and pinching techniques to make miniature shelters, perfect for any ‘little folks’ who may be wandering your woodland or gardens. Along with guidance from Hannah on how to build and design out of clay, Denise will discuss how to best design around your new piece of mini real estate. Materials and supplies are included…..plus, as with most all classes here at Fernwood, tea and scones will be served! If I were to have something ‘catchy’ printed on my aprons it would be just this….” Hell knows no fury like a woman’s scone”. Ha! Actually, Rick said this to me one day while munching on one of those yummy ginger scones I make. He’s so clever! It is a little play on words from the famous playwright, William Congreve and his 1697 play, The Mourning Bride. “Heaven has no rage like love to hatred turned, Nor hell a fury like a woman scorned,” spoken by Zara in Act III, Scene VIII. (This is usually paraphrased as “Hell hath no fury like a woman scorned”). Mix all dry ingredients and whisk to distribute the baking soda and baking powder. Add the butter and cut it in as you would for making pie dough, I always do this by hand. The butter should remain as ‘pea size’ bits in your flour mixture. Add the grated lemon rind. Mix in 1- 1 1/2 cup of blueberries or ginger or cranberries ( depending on the type you are making) Next, make a well in the center and add the cream and buttermilk. Mix briefly to incorporate ( don’t over-mix). Put dough onto a lightly floured surface , fold onto itself and then use your hands to pat the dough into a 1 1/2″ thick round about 8 inches in diameter. Cut wedge-shaped scones out of this. Bake in a pre-heated oven at 375 degrees for about 25 minutes. Enjoy!